Howard Street marks most of Chicago’s northern-most limit, though the city line jumps a few blocks northward from Clark Street to the lake. Walking down Howard, though, you wouldn’t suspect you were on the farthest hinterland of the great metropolis. 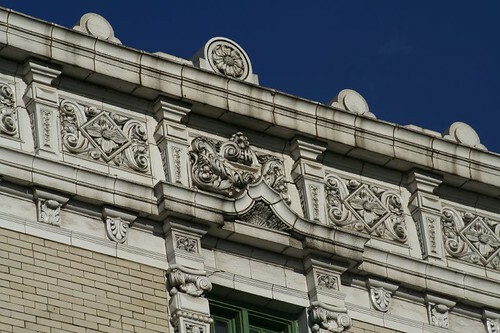 Howard is fully qualified to be the main street of an entire town, with grand commercial buildings, a magnificent theater, and highrises both old and new. Howard also benefits from its status as a transportation hub. The Red Line, one of CTA’s busiest rail lines, terminates there, handing things off to the suburban Purple and Yellow lines. Numerous bus lines arrive here as well. Howard has a reputation as a not-so-nice place in general, a reputation which tends to spill over to the rest of Rogers Park. It’s a bit inexplicable, given its location. 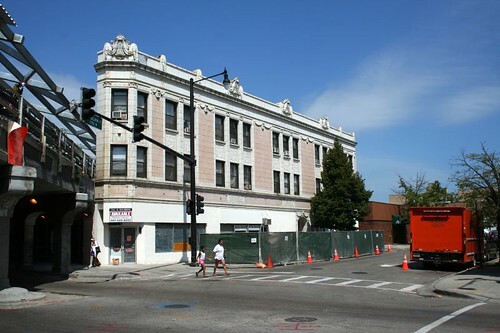 Well-served by rail and bus, sandwiched between tony Evanston and the inevitable northward march of gentrification, only minutes away from the lake, it is only a matter of time before real estate here goes through the roof. When it happens, the architecture will be waiting. 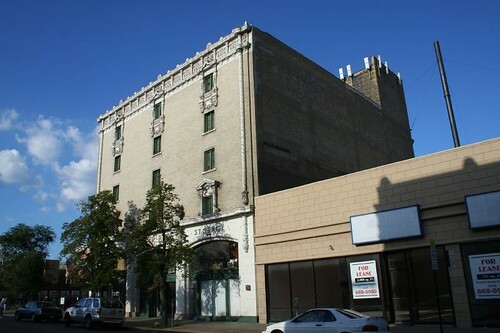 The high point is the Howard Theater Building (Henry L. Newhouse, who also did the south side’s similarly-styled Atlantic Theater.) 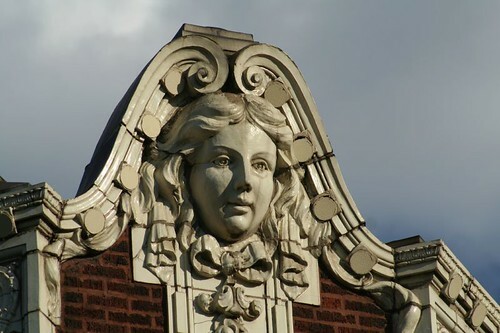 Like so many other Chicago neighborhood theaters, it was built in 1917, in the rush of post-World War I escapism. 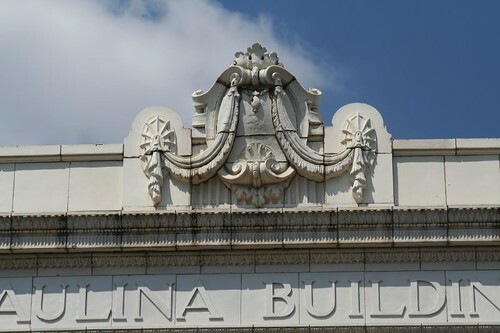 The auditorium was razed in 1999, but the lobby and commercial portion remain, converted to condominiums, and still spectacular. Heading east, there’s a short gap for a public park, followed by another jewel, a massive 1925 apartment building named the Broadmoor. 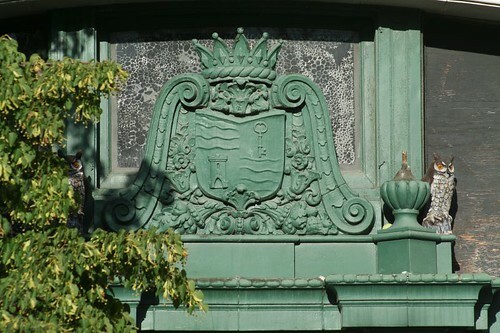 The entrance and the corner shield ornament are both extravagantly luscious. 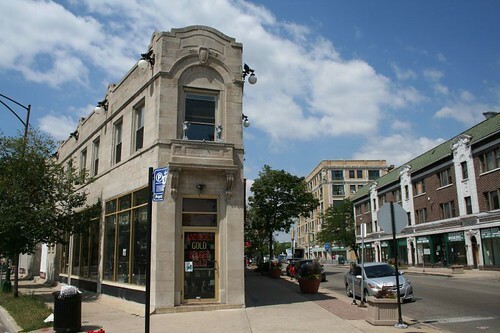 Like S. Michigan, the district is a sampler of architectural styles and trends, yet totally different in its atmosphere. Its prospects are likewise different; a huge condominium building recently went up, testifying to this area’s rising future. The problems will pass away in time; residents may well struggle with the rising costs. 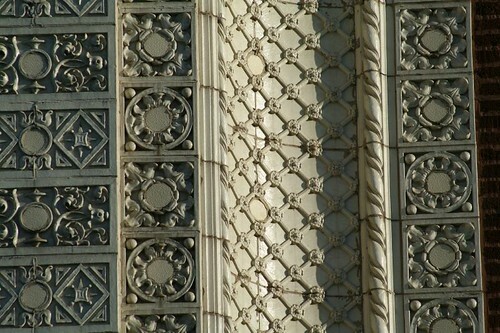 But the beauty of the architecture will remain. 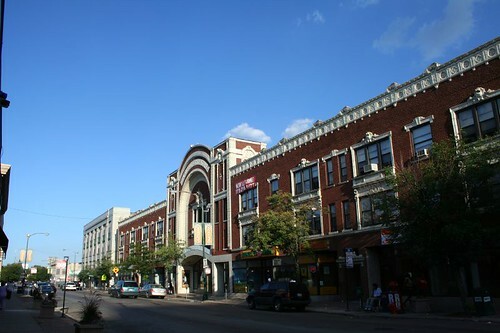 This entry was posted in Commercial strips, Rogers Park, theaters. Bookmark the permalink. Robert, the new high rise is an “affordable” (i.e. 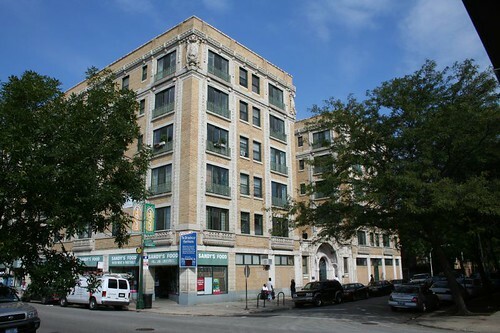 1200/mo one bedrooms) rental which was heavily pushed by Evanston (which it’s in, of course).My parents remember when the Chicago side was lined with liquor stores, back in Evanston’s dry days. This is one of the weirdest areas of Chicago with a very strange diversity, if you will. Right wing hippies, gentrifiers, long time Jewish residents, poor blacks, slumlords, etc all jostle each other here. 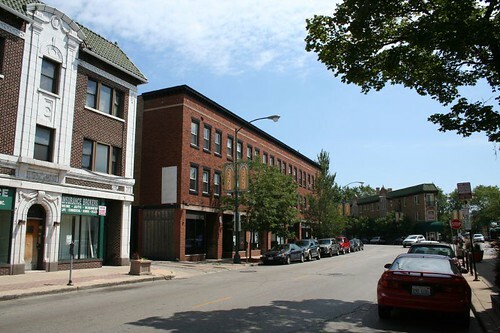 I used to live in Rogers Park.. 7400 blk of Ridge.Let me tell you about Howard Street.The Chicago line does in fact jump north – east of Clark and towards the lake. This Jonquil Terrace section as referred to as ‘The Jungle.’The corridor has been rehabilitated a lot recently. Years ago, the neighborhood really was a gritty scene of drug pushers, pimps, and prostitutes. This was before the days of Police cameras, all up and down the street. Howard St. is also the northern boundry of the city neighbohood of Edison Park, where there is a variety of homes from the 1890s to now. 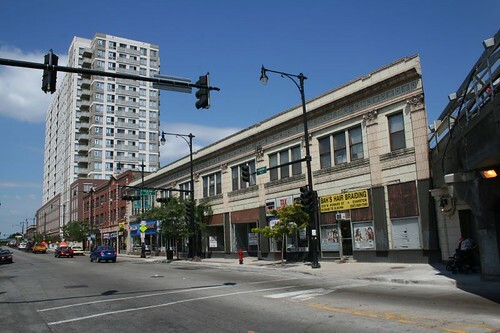 It was one of the first annexed areas in 1889.From 7200 w to about 7800 w, Howard is boundry between Niles and Chicago. I’m old enough to have gone to movies at the Howard theater, near its demise. My dad worked at the Gale school, just north of the strip and my uncle lived in the Jonquil Hotel, which was something out of the old Baretta TV show when I would have to go in to get him in the early 1970s. There was still proper business on Howard A Walgreens on the corner 1 block east of the L. Next to the theater was a nice sit-down restaurant. 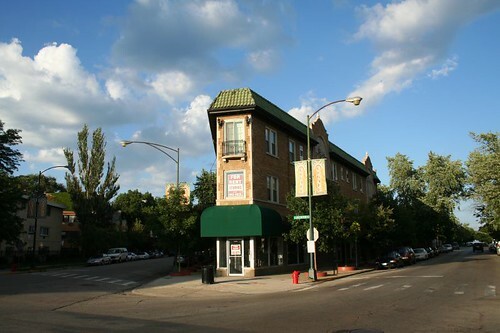 For all the liquor stored mentioned on Howard the busiest might have been the one in the pedestrian approach to the Howard L, which fronted Hermitage. But there was also a fast food stand with a service window that faced the massive bus depot and a camera shop and a big Fannie Mae candy store that wrapped all the way around from Howard St. And it could be because I was just a little kid, but I thought the donuts sold in the shop opposite the fare turnstyles were O so good. Howard was a vibrant place and all the Evanston side was full of shops, except for one big gap where there was a lot that a cab company used (I think). The big Sun Flowers was the anchor store at the top of Howard and Clark. 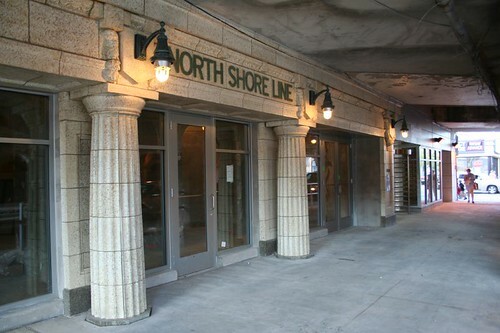 I couldn’t speak about the area at night, I’m sure it was rough, but Howard St. had that rep for years, after all the sailors would come off the North Shore trains to drink in all the saloons on the street, in the war years and later into the 1950s. It’s a shame is has been smothered in suffocating poverty and drug crime for at least 3 decades. I miss Howard Bowl. I did a lot of bowling there in the 1980’s. I miss Howard. I grew up in RP & roamed all over Howard back in the day. 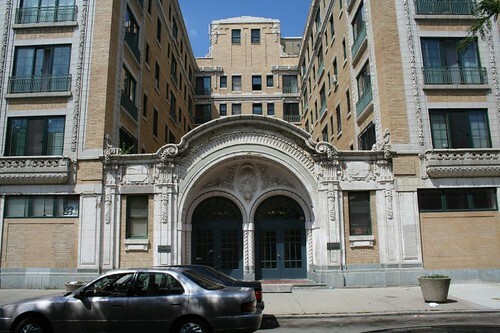 I even lived north of Howard in a beautiful courtyard building on Hermitage just north of Jonquil from age 11-14. I thought it was heaven then & I spent many weekends watching movies at the Howard Theatre & riding the L downtown. I’d give anything to go back there. Walking to the lake in summer. I remember a bowling alley upstairs somewhere. I think it was on Paulina just north of Howard & an Italian restaurant pizza place. Villa Gergenti??? Or something similar. My first job was at the Woolworth lunch counter on Howard when I was 14. I have visited home many times since then & watched all the changes from horrible to getting better but even in the worst of it’s times I have never been afraid when I’m there. Home is home. I’d go back in a heartbeat if I could.